For the song this mission is named after, see Tide Goes Out. — intro to the final boss fight. Tide Goes Out is the fifth and final boss mission in Splatoon 2's single-player mode, Octo Canyon. A cutscene displays the location of the Boss Kettle and can be found on the map. The player must use a UFO and their ink to jump towards the kettle and enter it in squid form. A brainwashed Callie in new gear. DJ Octavio and the Octobot King II look similar to the final boss from Splatoon. The only exceptions are that a lot of areas on the weapon have changed from a silver color to gold and there is an extra platform on top of the weapon where Callie stands. DJ Octavio still has stalks of wasabi next to his turntable, but also some takoyaki (octopus balls) in front of the turntable that are used in later attacks. Octavio now wears shutter shades and a kabuto helmet with spikes on it. Callie wears a short black tank top with black shorts and purple tights with sequins, giving them a "galactic" look, as well as gold octopus earrings, an octopus tentacle where her old headpiece sat, and the Hypnoshades that keep her under Octavio's control. To defeat DJ Octavio, the player must shoot back flying fists sent by his Octo Weapon. In the final phase, this is done by a modified Rainmaker. After this is done, the player can shoot DJ Octavio, who falls out of his weapon, to proceed to the next phase. DJ Octavio sends golden, flying fists at the player that must be shot to be sent back and cause damage to him. The hands rumble and glow pink just before they are shot to give the player a hint at when they are going to be launched, and turn green when shot with enough of Agent 4's ink. After four fists are shot back, Octavio will send out a spinning punch that cannot be hit by the player, with the only option being to avoid it. After shooting fists, Octavio can sometimes launch a Bomb Rush that sends out four large Splat Bombs. These are larger than usual but still work like ordinary Splat Bombs and should just be avoided. Octavio sometimes launches two fists at a time - the best choice is to focus on one, and if shot back successfully, the player should try ink the other, because their ink stays on the fists even when they retract. However, when a fist starts rotating for a spinning punch, it will clean off all the player's ink that is already on it. If neither fists are spinning and one of them is shot back at just the right angle, it will hit the other one, covering it in the player's ink and sending it back as well. After successfully shooting back four more fists, Octavio will fall off the Octobot King II and the player can shoot him. The second phase begins with the Octo Weapon raising higher. The attacks such as the flying fists are the same in this phase. Octavio can sometimes send small balls with Octarian tentacles in that can be shot down in the air or when they fall on the ground. If a ball is not shot after a short period of time, it creates a tower of purple ink that will harm the player if touched. It is best to shoot as many balls as possible in this short time because if not, they can reduce movement whilst dodging other attacks. In this phase, Octavio can fire two spinning fists at a time and uses a Bomb Rush of large gold Suction Bombs. Just like before, the bombs are bigger than usual, but work the same as the originals. Another new attack in this phase is when the weapon turns its speakers into Ink Pistons and dashes across the arena with an ink shower pouring from the bottom of the weapon like the Octo Shower. This will splat the player if caught under it. After shooting back enough fists, Octavio will fall off the Octobot King II again and the player can shoot him to finish Phase 2. In Phase 3, DJ Octavio is much faster and often dashes to the side before sending a fist towards the player. Aside from this, all his attacks are the same as the last phase. The player being given the Rainmaker by Sheldon. In the final phase, the player is given a modified Rainmaker by Sheldon. They then Super Jump to a set of Ride Rails above the arena to follow DJ Octavio in the Octobot King II. Whilst grinding, the player must shoot the normal flying fists with the Rainmaker and avoid the spinning fists by jumping. After eight fists are shot back, DJ Octavio will fall and the player must move to a new Ride Rail at the center to finish him off. At the end of the rail, the player must jump and land on Octavio with the Rainmaker to finish the final boss. The scene will then transition back to the title screen in Inkopolis Square, with Off the Hook finding out that the Great Zapfish and Callie have returned and with someone requesting the song Fresh Start, which plays over the credits. If the player replays the stage again and defeats the boss, instead of the cutscene showing, a Zapfish doll appears instead with the whole stage empty and quiet and the player will receive 100 Power Eggs, in an identical process to the other boss battles. DJ Octavio and Callie together. Marie and the Hero Charger. Marie takes aim at Callie. Marie calling out to Callie. Agent 4 using the Rainmaker. The ending 'Victory' banner across the screen is different from all the standard boss endings, as it is the same as when the player wins a Rainmaker match, but with the colors pink and green, both resembling Callie and Marie's colors and Splatoon 2's primary colors. The ink colors used in the fight are purple and green, which resembles Callie and Marie's ink colors, as well as the colors used to represent Octarians vs. Inklings (as seen with an image of the Great Turf War and the Splatfest, being Squid vs. Octopus). While replaying the mission, Marie also comments during the mission that the ink colors reminds her of the final Splatfest, being Callie vs. Marie. The Charger Marie uses to shoot off Callie's shades is the Hero Charger from the first game, which could have been the weapon she used as Agent 2. If the mission is replayed, it is shown that Callie puts the Hypnoshades back on by herself. When asked why she answers that they "look good on [her]". Octobot King II's fists have 'OCTA' and 'TACO' engraved, likely referencing 'Octavio' and 'tako', meaning octopus in Japanese. In the Japanese version, while Callie is brainwashed, she speaks in katakana, similar to DJ Octavio and Marina, indicating that she is talking in Octarian language and not in Inkling language. During Phase 3, when the brainwashing is starting to wear off, her text becomes a mix between katakana and hiragana. The level's name, "Tide Goes Out", is named after to Marie's solo song of the same name. Likewise, the level's subtitle, "Bomb Rush Blush", is named after Callie's solo song of the same name. This is the same in the Japanese version. 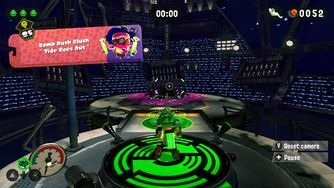 During the fight, Callie and DJ Octavio perform a remix of the song. The labels on Octavio's Suction Bombs have Callie's eyes that represented her Splatfest Power in the first game. The stage in which the boss fight takes place has a striking resemblance to the center of Inkopolis Plaza. Spanish (NOE) ¡El desenlace final! The final conclusion! ↑ From "baars" (perch) and "baas boven baas", a Dutch phrase for "there's always a bigger fish"
↑ The name "タコツボ" ("Takostubo") is also used for the place of residence for the Octarian society, being Octo Valley and Octo Canyon. Secret Bowling Alley • Octocommander Fortress • Towering Heights • The Experimentorium • Propellerland • Octolings Ahoy! This page was last edited on 20 February 2019, at 10:40.